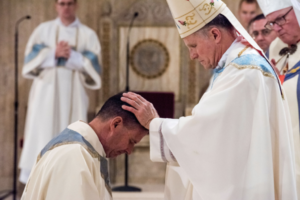 Our beloved diocese, AMS, now has two new auxiliary bishops. 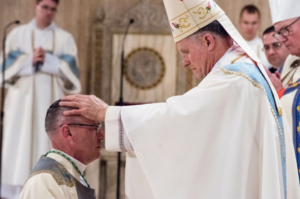 Bishops William (Bill) J. Muhm and Joseph L. Coffey were ordained on March 25—the Solemnity of the Annunciation of the Lord—at the Basilica of the National Shrine of the Immaculate Conception. His Excellency, the Most Reverend Timothy P. Broglio, served as principal celebrant and ordaining Prelate before a congregation of more than two-thousand. Many MCCW members and clergy, from the surrounding installations, attended this beautiful ordination. After the nearly 2 ½ hour Ordination Mass, I had the privilege of enjoying conversation and a quick photo with some of our Promised Priests. This Lent, please continue to pray daily for our AMS Co-Sponsored Seminarians. 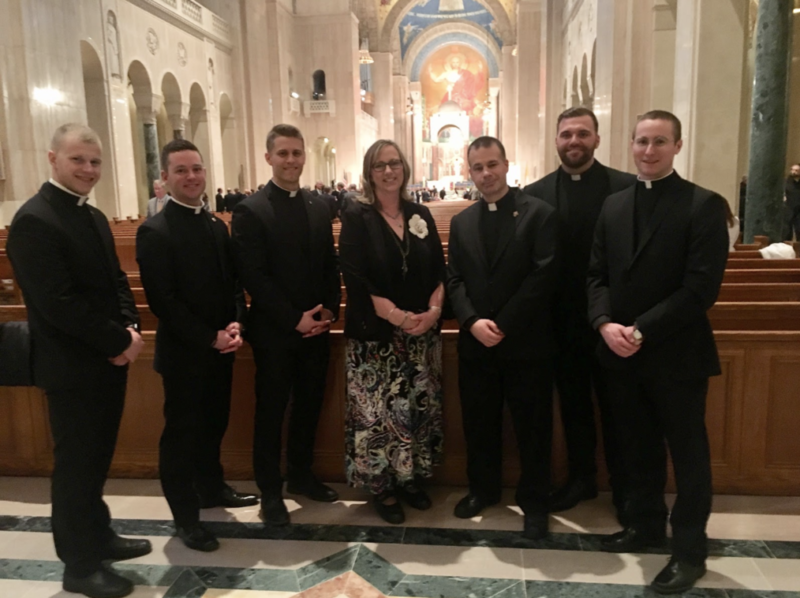 If your CWOC would like to adopt a seminarian—to pray for him, send care packages, and/or spiritual bouquets, please contact Denise Hummel at amsliaison@nullmccw.org. Welcome to our new AMS Bishops! Laying of the hands by Archbishop Timothy P. Broglio, AMS Archbishop.